Fill a container in which the object can be completely immersed with water. Shake the marbling paint well. Hold the color close to the water and let it drip onto the surface. 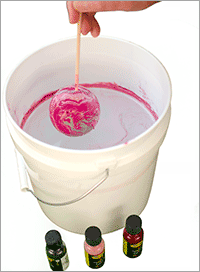 Note: You will not be able to completely clean the containers after using them for marbling. We recommend that you protect the containers with a plastic bag. The more color you let drip into the water, the more intense the marble effect. 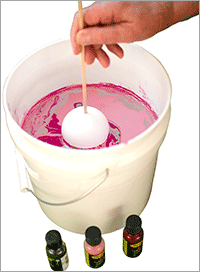 Do not use more than 15 drops and a maximum of 4 colors when using Styrofoam articles. After dripping the droplets of color into the water draw the marble pattern quickly using a wooden rod. 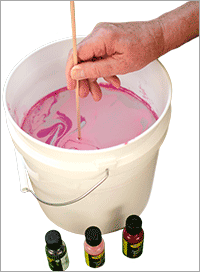 Use 2 - 3 colors to achieve the best marbling results. Secure the object to a wooden rod or other disposable item for handling. Slowly immerse the object in the water below the paint surface. To prevent a second layer of color forming on the object, use a paper towel to remove excess paint before removing the object. Let your finished object dry. Depending on the base material of the object you are marble-painting, the color will be dry to the touch within 15 - 30 minutes. You can wipe the objects after they have dried completely. Before dipping a second object, carefully remove the excess color from the surface of the water using a the edge of a sheet of paper or paper towel. 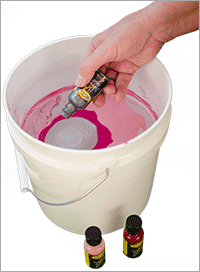 Remove any paint residue before adding the new marbling colors. Several objects can be dipped using one container. Replace the water when it becomes too dirty with paint residue.